Honoree David Letterman does an interview at the 20th Annual Mark Twain Prize for American Humor at the Kennedy Center in Washington, DC, on Oct. 22, 2017. 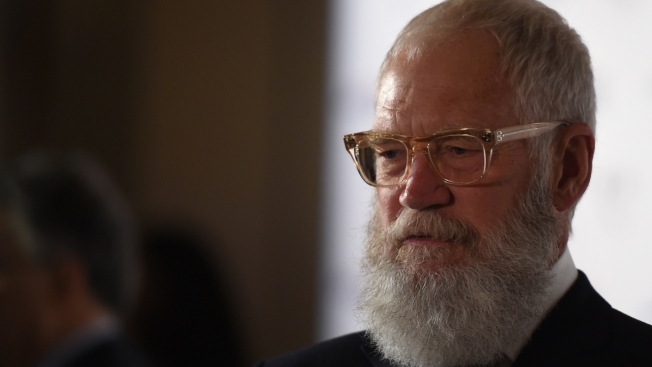 David Letterman was celebrated at the Kennedy Center Sunday night for his record run on late-night TV, innovative comedy routines and for helping the nation start to heal by reassuring that it was OK to laugh again after the terrorist attacks of Sept. 11, 2001. Now his career of comedy has earned him a prestigious award and a celebrity roasting. Fellow entertainers gathered to honor Letterman Sunday night where he was receiving the Mark Twain Prize for American Humor. Among those in attendance were previous recipients Steve Martin and late-night host Jimmy Kimmel, who recalled a monologue he gave on his show shortly after 9/11. "You let us know it was OK to move on and OK to laugh again," Kimmel said. "Dave, you led the way for all of us." Kimmel jokingly blamed the election of President Donald Trump on Letterman's retirement in 2015. "It's like you went out for cigarettes one day and left us in the hands of our abusive, orange stepfather," Kimmell said. The crowd included comedians Biff Henderson, John Mulaney, and Jimmie Walker of the 1970s television series "Good Times." Walker gave Letterman one of his first jobs as a joke writer in Hollywood. "Dave has always had excellent instincts. What better time that now to choose to look like a Confederate war general," Steve Martin said. Letterman's run on NBC in particular was hugely influential, introducing a sardonic, irony-drenched comedic style that influenced a generation. His time slot immediately following Carson's "The Tonight Show" allowed Letterman to draw a huge following of young, largely college-age viewers seeking an alternative to the somewhat staid Carson model. Letterman introduced the country to fringe musical acts that might never have received an opportunity on "The Tonight Show." His humor was undeniably intelligent, but also at times surrealistic and silly. He pioneered segments called Stupid Pet Tricks and Stupid Human Tricks. He tossed watermelons and other objects off a five-story building; at one point, he wore a suit made of Velcro and jumped onto a Velcro-covered wall, sticking in place. He turned bizarre characters like Larry "Bud" Melman into cult celebrities. Letterman started his career as a radio talk show host and TV weatherman in Indiana. In the mid-1970s he moved to Los Angeles, performing stand-up comedy and writing jokes for (at the time more famous) stand-up comic Jimmy Walker of "Good Times" fame. Eventually he caught the eye of "The Tonight Show" and Carson, performing several times on the show and becoming a regular guest host starting in 1978. NBC gave Letterman his own show following Carson; "Late Night with David Letterman" debuted on Feb. 1, 1982. Letterman's first guest that night? Bill Murray, the Twain award recipient in 2016.